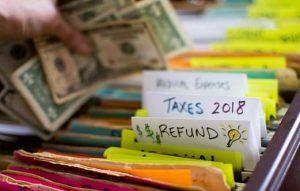 If you're getting a tax refund this year, or if you've already gotten yours, how will you spend it? Or will you save it? Read on for some useful ideas on what to do with that money! Q: I’m getting a tax refund that’s more than I expected this year. How can I use it responsibly? A: Whenever you receive an unexpected windfall, it’s always smart to be proactive about how you’ll spend it instead of letting it just blow through your checking account. Below, we’ve listed some dos and don’ts for you to consider. Consider earmarking 20% or more of your windfall toward paying down high-interest debt you may be carrying. You’ll save a ton on interest and you’ll be finished with this debt sooner than you’d planned. Lending all of your refund money is not the best idea. You might not see that money for a while. And, if you do, it’ll likely be in small repayments instead of the large chunk of cash you have now. That severely limits what you can do with it. Take $1,000 out of your refund and use it to start a savings account. You can set up an automatic transfer from your checking account each month to help it grow, even if you can only afford as little as $10. You can also use this opportunity to start investing. Say you receive an annual refund of $2,800 and invest this money at 6% interest. If you continue investing this amount each year, you’ll find yourself with approximately $250,727 in 30 years’ time. That’s making your refund work for you! Don’t be lazy about saving your money. Keeping all that cash in a low-interest savings account or an ordinary checking account with little to no interest will dramatically decrease its growing power. If you need help deciding where to invest or save your refund, call or stop by one of our branches where a member service representative is happy to help. Click here for information on our high-rate 15-month Certificate! Advance your career and increase your earning power by using your tax refund to pay for a work-related conference, additional training in your field, or for learning an entirely new skill. Don’t spend your entire refund without planning or you’ll be setting yourself up for disappointment later. It’s OK to celebrate with one or two bigger purchases you’ve been eyeing throughout the year. Many tax software programs offer the opportunity to get refunds via gift card. If you’re offered this choice, opt out. You always stand the chance of losing the card, and it limits the ways you can spend your refund money. The bonus cash in your pocket gives you the opportunity to give back to the community in ways you might not be able to afford throughout the year. Your Turn: How are you going to spend your refund this year? Share your plans with us in the comments!